The following is an essay I wrote back in 2002. At the bottom of this essay there will be a link to some of my photos of the day, and my first-person account of the day. I don’t need to keep saying more. This should be enough. I wanted a way to honor this. 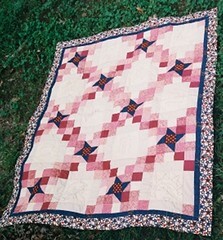 I decided that around the border of this quilt, I embroidered the initials of some lost that day. In the blocks are folk-art styled symbols of the events. I was fortunate enough to know few. But step outside the line, just one step from my door, and there are many people I know who lost friends and family. I would like to use their initials on my quilt as well.